Located nearly two hours north of the Canada/United States border is the city of Lethbridge, Alberta. A family friendly and fun community, Lethbridge is an ideal stop for any two nation vacation. News from Glacier National Park Currently, 17.0 miles of the Going-to-the-Sun Road are open for travel. Montana’s westernmost region beckons. Grand landscapes and small-town hospitality make for authentic experiences and unforgettable moments. Looking to create your own Montana experience? Adventure unfolds in every direction. Deciding where to go while you’re here won’t be easy (it’s a pretty big place), but what you’ll quickly discover is that there’s so much Montana to see, you’ll be planning your next trip before this one is even over. Here are some easy ways to get started. From laid-back weekend jaunts, romantic getaways and family vacations, to complete cultural experiences, there are seemingly endless options for adventure in Western Montana. Western hospitality at its finest. After a day of epic exploration, relaxation and rejuvenation are in order. 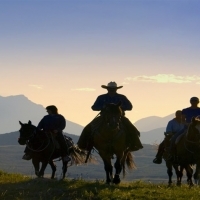 Western Montana boasts five-star luxury lodging, riverside camping, and everything in between. Explore our diverse accommodation options for trips of any length and style. Eat and drink in Montana's Glacier Country. At first glance, Montana may not seem like a dining destination, but we’re happy to report it’s exactly that. With incredible fine dining restaurants, steakhouses, bakeries, bars, breweries, food trucks and cafés serving up a mix of everything—for every kind of eater—Montana is an adventure in food, too. Start planning your Montana vacation. It’s always good to have a plan, so you can get the most out of your Montana experience. But that doesn’t mean you shouldn’t spontaneously wander off the beaten path while you’re here. The Crown of the Continent beckons. You don’t even need to see what’s around the next bend to be stopped in your tracks at Glacier National Park. The sheer beauty is jaw dropping from every angle. With over 1 million acres of towering, jagged peaks, cascading waterfalls, wild meadows and sparkling waters, plus wildlife watching and recreation opportunities, it is, quite simply, the vacation of a lifetime. Remember Me Forgot Your Password? Sign up to start planning your vacation.